Marketing consulting and design for new company establishing itself as a leader in the hypnosis industry. The Hypnosis Network, a self-help CD publishing company, gathered the nation’s leading psychologists to create world class hypnosis programs. Believing that hypnosis was an unrivaled tool for many self-improvement topics and frustrated with the poor quality and huckster resources available, the company founders set out to create a company dedicated to providing safe, effective, and powerful hypnosis programs. 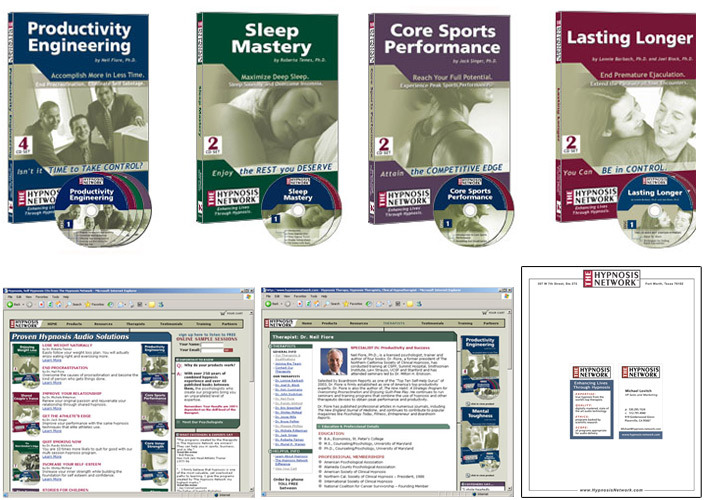 The company focuses on creating and selling hypnosis programs unparalleled by competitors, while educating the public on safe hypnosis options. The Hypnosis Network directly manages every aspect of their business: recruiting the nation’s leading psychologists, guiding the program development and recording process, finalizing post-production of programs, creation of packaging and marketing materials, production of CDs, creation of resource material, online and retail sales, affiliate programs, and more! The Hypnosis Network founders came to me with a great idea and a general business plan, looking for a partner to manage and create the company’s corporate branding from the ground up, as well as build and maintain the website that would be their initial sales tool. Our largest concern was the total lack of professionalism in the hypnosis industry. We needed to create a corporate image that evoked the cool professionalism of our medical origin, while remaining warm and inviting for customers. We would also need to forge a new marketing/sales technique that was not as salesy and pushy as our competitors, knowing that this tone would undermine our goal to build confidence in our products. We created a project plan, which included logo development, paper system creation, product packaging suite, initial informational website, the development of an extensive ecommerce and informational website, and other affiliate and sales tools implementations. I knew that for this project to be successful, I would need to “own” everything about my contribution to it. My role was to guide the entire design discovery process, project manage the development of each piece, and leverage the expertise of the owners to get the best results. I started with an idea of color palettes, reaching for strong jewel tones that were gender-neutral and offered the possibility to define both our website sections and our product packaging categories. Every option we considered in the beginning had to be applied to the many mediums we would utilize – print and web, traditional and online marketing campaigns – and weigh against our overall image of professional but welcoming. The challenges didn’t end with design choices. We needed to analyze and select technology to manage ecommerce, knowledge bases, rss feeds, affiliate programs, and more. Most importantly, we needed to architect and develop a website to show the world that we were a leading resource for both our product and knowledge about our industry. Beginning with logo designs, I conceptualized and established our corporate branding, colors, and paper systems. Our initial website was created to recruit psychologists to create programs for us, and allowed us to test out design and layout ideas for later use. We simultaneously developed the main website and the product packaging, both large projects that required numerous rounds of designs and redesigns to capture the right balance of elements. Launching with 12 products, I utilized many project management tools like content forms and product packaging templates to streamline the content development process on both the web and print sides. Over the course of 8 months, we careened toward our launch goals. Our initial recruiting website and branding evoked such a sense of professionalism that it was a key tool to recruiting the first of our renowned psychologists. Upon launch of our main website in February 2005, it was obvious that we were a different player in the hypnosis industry. The website had a substantial amount of information and resources, with room to grow in every topic we covered. Our product packaging was well-received by potential retail partners and brought our virtual product elegantly into the hands of the customer. Our sales and marketing tools continued to develop and fine tune for optimal sales conversion. The Hypnosis Network has hit the playing field with an arsenal of outstanding resources and tools to offer a whole new brand of hypnosis solutions.